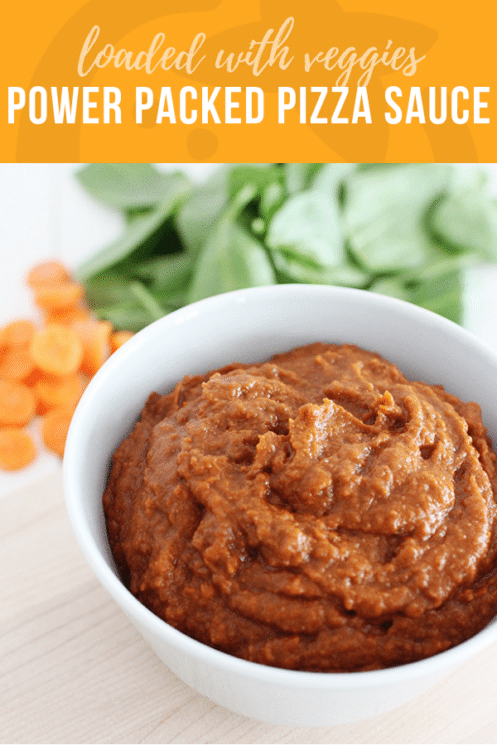 Our Pizza Sauce Recipe is crazy fast to make and is packed with extras for maximum nutrition and flavor! How Do You Make Homemade Pizza Sauce? 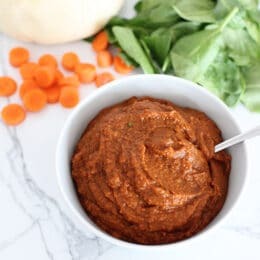 You can buy pizza sauce in a jar, but if you are going to make your own pizza dough from scratch, why not make your own sauce to go with it. The key to a good pizza sauce recipe is making sure it is thick enough, and also that it won’t take you forever to make. 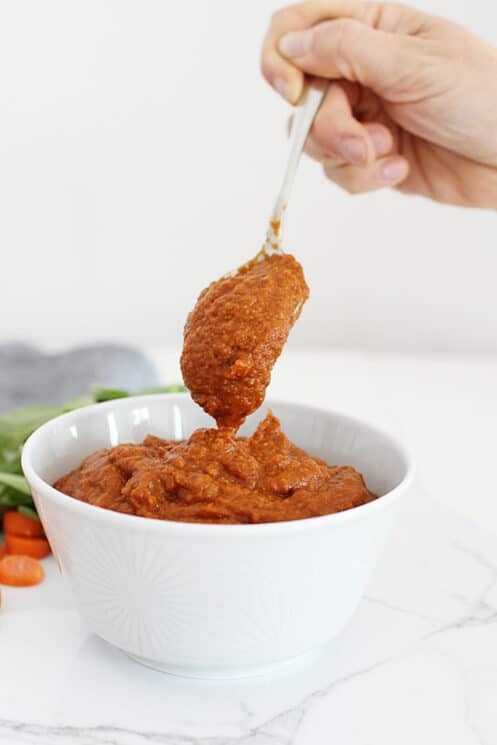 Our pizza sauce recipe takes elements of a regular homemade sauce, and then adds nutritionally power packed ingredients to make it an amazing sauce! 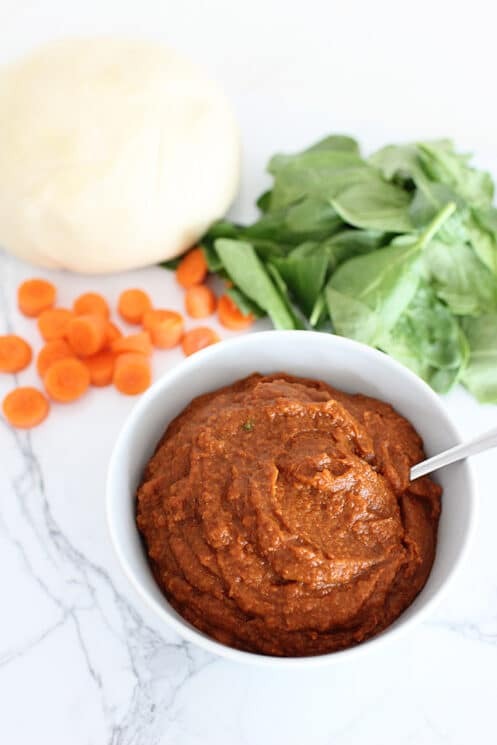 This way you are adding Vitamin A, B-Vitamins, Fiber, Protein……..this is definitely a sauce you can feel good about feeding to your kids. I added a lot of beans and so mine turned out pretty thick. It had the consistency of a hummus, but tasted like pizza sauce! You can definitely add less beans based on the type of consistency you are going for. 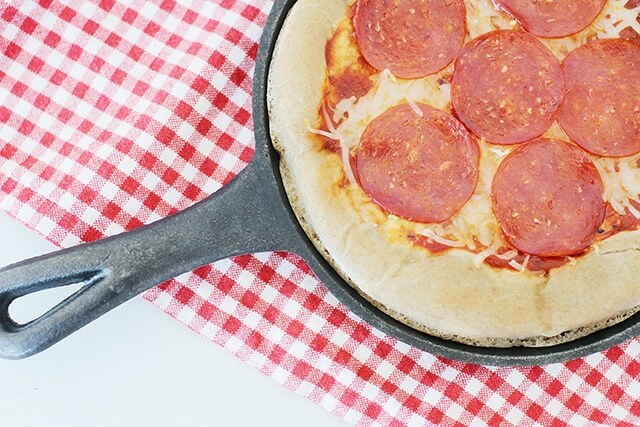 Spread on your pizza crust, add toppings and bake like you normally would. What is the Best Pizza Crust To Use With Homemade Pizza Sauce? We love our homemade pizza crust. It is thick, chewy and made completely with whole wheat! It pairs really well with a thick flavorful sauce. You will never look at pizza nights the same way with these two recipes. Kids love to eat pizza and if you make it packed full of good nutrition, then let them eat it! Peel and slice carrots thinly. Add to a small microwave safe dish with enough water to cover the carrots. Cook for 1-2 minutes or until they have softened enough to blend with other ingredients. 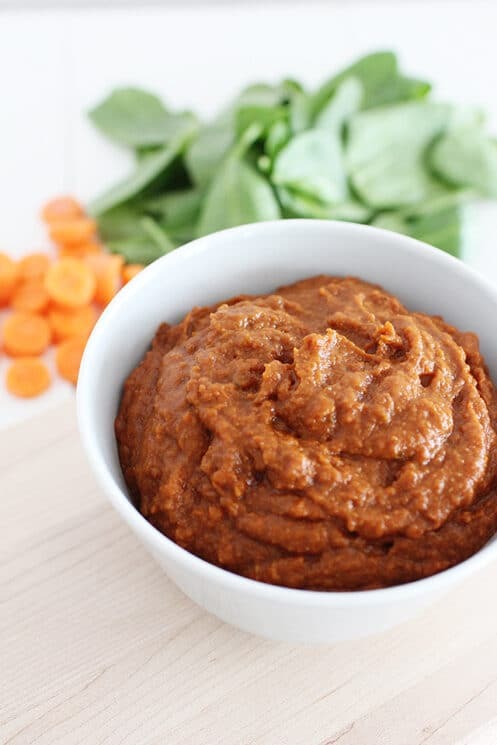 Add sauce, carrots, spinach, drained beans and seasonings to a blender. Mix until smooth. This looks lovely. I’m a fan of adding beans and lentil to all sorts of sauces. Ill add this one to my collection. I found myself with some extra avocados this week and wanted some pasta so I decided to combine the two and see what I could come up with. oh my gosh, this is genius. my youngest is so picky when it comes to fruits and veggies, so this will def tempt him. i’m trying it ASAP, thank you sooo much for keeping the picky eaters in mind with your recipes! Grated veggies work well too. If you cook the saice long enough it all mushes down. We add carrot, zucchini, spinach and lentils (any type work well but my favourite is red with tomato sauce or green with Bolognaise). Pumpkin/squash etc work particularly well in pizza sauce, we often do half tomato paste half mashed pumpkin. I loved this idea so much that I tried it last night for dinner. I added pureed carrots and garbanzo beans into my pasta sauce. My 10, 15, and 17 yr olds never even noticed a difference. I do this a lot. Pureed sweet potatoes and winter squash are good additions too; tames some of the acidity of the tomatoes. Yum, I will have to try that on my next pizza. I would never had thought to add beans – great idea! Whether pizza is healthy or not is really determined by the quality of ingredients used and the choice of cheese – full fat or skim milk. Most pizzas are high in saturated fat, salt and calories. ?antastic ?oods from you, man. I ha?? be mindful y?ur stuff prior to aand you are simply extremely excellent. it. You are ma?ing it e?tertai?in? and ?ou still care for to keep it sensible. I can’t wait to read much more from you. That is really a wonderful site. I think the admin of this web site is really working hard for his site, because here every information is quality based stuff. I am sending it tto a few pals ans additionally sharing in delicious. web-site. Allow me to pay you. CAN YOU PLEASE SUGGEST QUANTITY AS I WOULD LIKE TO TRY THIS FOR MY 4 YR OLD FUSSY EATER SON. This makes enough to spread on one large pizza, or about 3/4 cup. If toddlers love toast (100% whole wheat ) as much as mine, I don’t get any objection to using the 100%WW toast in place of pizza dough. So quick!